The surf comes right up to the North Myrtle Beach resort of Ocean View Villas. This three-story North Myrtle Beach resort is in the famous Cherry Grove section of North Myrtle Beach, South Carolina and it is at the northernmost end of the beach. The Atlantic Ocean meets the salt marsh inlet at Ocean View Villas, giving guests of this North Myrtle Beach resort a special panoramic vista. This North Myrtle Beach resort is right on the oceanfront. It is a North Myrtle Beach resort with a security gate and a centrally located swimming pool. Ocean View Villas is a unique retreat for your North Myrtle Beach vacation. There are two separate buildings at Ocean View Villas and both buildings feature two sets of stairways to get from the ground level parking area and swimming pool deck to all three levels of this North Myrtle Beach resort. Each of the North Myrtle Beach rentals at Ocean View Villas has a water view balcony. There is a constant breeze coming in off the Atlantic Ocean and the salt marsh inlet so sitting on the balcony is a pleasure any time of year. 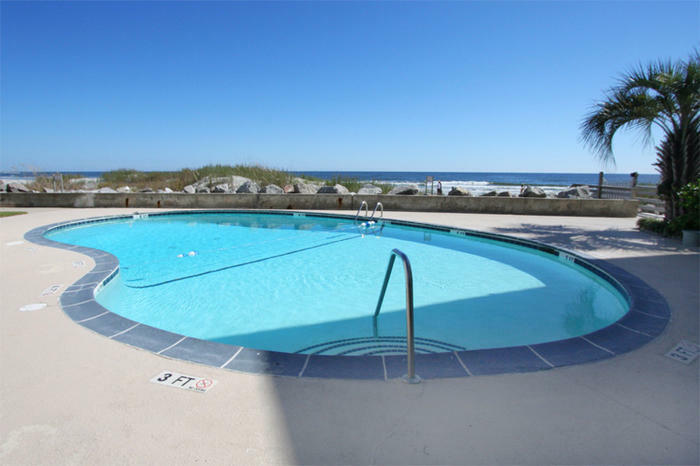 The views are hard to beat and the fact that you are surrounded by water on two sides of this North Myrtle Beach resort makes it that much more of peaceful North Myrtle Beach vacation destination. This mid-size North Myrtle Beach resort only has 48 North Myrtle Beach condominiums. Skip the hustle and bustle of those North Myrtle Beach resorts that are so large that you get lost in the crowd. Enjoy this ideal size where the swimming pool area is less crowded, as well as the white sandy beaches at low tide. This intimate setting in the Cherry Grove section of North Myrtle Beach, South Carolina is great for families with kids, a romantic rendezvous and golf buddies who are in town for golf and some relaxation. The North Myrtle Beach vacation rentals at Ocean View Villas are all two-bedroom, two-bath North Myrtle Beach condominiums. These North Myrtle Beach condos sleep either six or seven people. These North Myrtle Beach condos are individually owned so the interiors are all different, though the layout is the same. These two-bedroom condos in North Myrtle Beach, South Carolina feature an eat-in kitchen. There are full-size appliances in each kitchen at Ocean View Villas and those appliances include a dishwasher! Everything you need is provided for your North Myrtle Beach vacation: microwave, toaster, coffee pot, blender and more! Elliott Beach Rentals is not affiliated with onsite management or the HOA of Ocean View Villas.